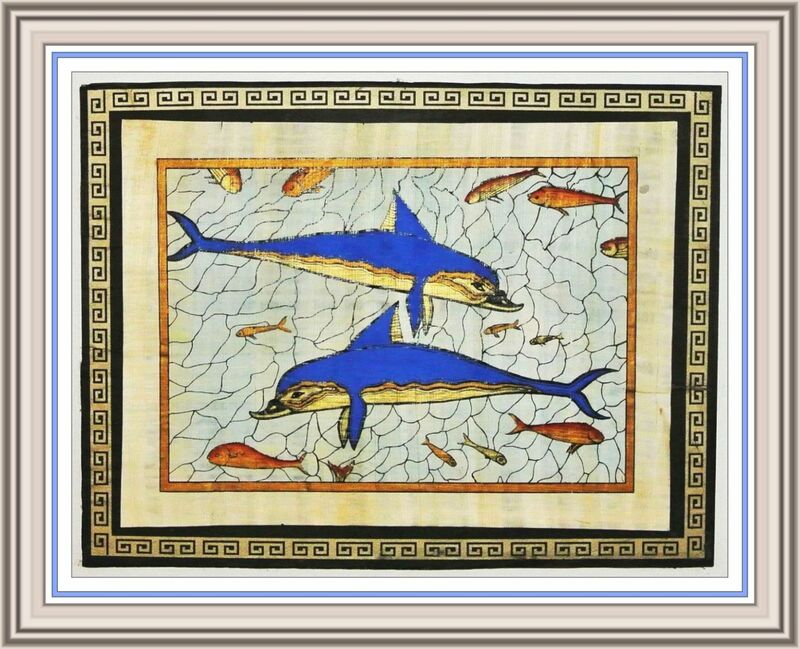 The Famous “Dolphin Fresco” at Knossos on Papyrus! Minoan Literature? Did any Exist? Here you see a magnificent reproduction of the famous “Dolphin Fresco” at Knossos reprinted on Papyrus, which I purchased for the astonishing price of 10 euros while I was visiting the site on May 2, 2012. The colours on this papyrus version are so vibrant no photograph can fully do justice to them. Nevertheless, the photo turned out wonderfully, and if you would like to use it yourself, please feel free to do so. I even framed it to enhance it. Then it was that the gods were formed in the midst of heaven. Lahmu and Lahamu were brought forth, by name they were called. Just because the Minoans, writing in Linear A or in Linear B, left behind no literature as such on their administrative inventory tablets, does not necessarily mean that they never wrote any literature at all. That strikes me as bordering on nonsensical, since Knossos always had the closest economic and cultural ties with Egypt and with all of the other great civilizations contemporaneous with her. Egypt, above all, set great store on the inestimable value of Knossian, Minoan and Mycenaean artifacts such as gold, in which the Mycenaean artisans were especially gifted, lapis lazuli, of which the finest quality in the entire known world issued from Knossos; Minoan & Mycenaean pottery and wares, which again were of the most splendid designs; Minoan textiles and dyes, again the finest to be found, and on and on. In fact, the Minoans were rightly renowned as the among the very best dyers in the entire known world. But why stop there? Why should such an obviously advanced civilization as the Minoan, with its understanding of the basic principles of hydraulics, quite beyond the ken of any other contemporary civilization, and with its utterly unique airy architecture, based on the the most elegant geometric principles, again quite unlike anything else to found in the then-known world, not have a literature of its own? To me, the idea seems almost preposterous. (c) If the Minoans & Mycenaeans did write any literature, what medium would they most likely have used for it? No walls or fortifications of any kind in evidence! That alone is a very powerful indicator of the critical commercial value of Knossos as the very hub of international commerce in her era. 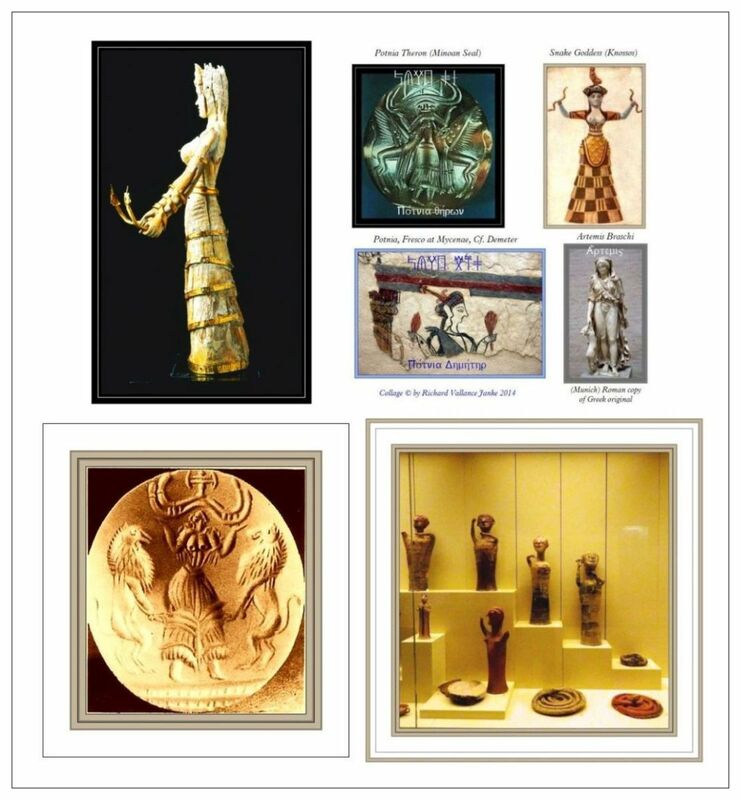 But more than anywhere else, the archaeological evidence powerfully evinces a very close trade relationship between Knossos and Egypt, since Minoan jewelry, textiles, pottery and wares have shown up in considerable amounts – sometimes even hordes - in Egyptian archaeological sites. The Egyptians clearly placed extreme value on Minoan goods, as exquisitely crafted as they were. So what? - I hear you exclaim. So what indeed. These major trading partners each must have had something to trade with the other that the other was in desperate need of. And in the case of Knossos and the Minoans, the Egyptian commodity they would probably have needed most of all would be, you have it, papyrus. The Cretan climate was not dry enough for them to produce it themselves. So they would have had to rely exclusively on Egypt for what was, after all, one of the most precious commodities of the entire Bronze Age. If we accept this hypothesis – and I see no reason why we should not at least seriously entertain it – then the Minoans may very well have used papyrus and ink to record their religious literature. There is some evidence, however second-hand and circumstantial, that they may have composed religious texts, and possibly even a religious epic, on papyrus. Given this scenario, I am seriously inclined to believe that not only did the Minoan and Mycenaean scribes writing in Linear B (leaving Minoan Linear A aside for the time being) keep track of religious rites, and possibly even compose a creation myth of their own on papyrus, but that they may very well have also written down a stripped down written version of their oral military epic, their own story of the Trojan War, and if so, the most accurate version of the events of that war. Their original history of the Trojan war would have almost certainly been much more factual than the version of The Catalogue of Ships in Book II of The Iliad, which must have been derived from it, had it existed. This would go a long way to explaining why the Greek of The Catalogue of Ships in Book II of The Iliad is written in the most archaic, and the most-Mycenaean like Greek in the entire Iliad – not to say that Mycenaean Greek does not appear elsewhere in both the Iliad and the Odyssey, because, surprise, surprise, it most certainly does. It is passingly strange that Homer bluntly states, in no uncertain terms, that Knossos and Crete were major contributors to the Achaean fleet in the Trojan War, since everyone these days, archaeologists and literati alike, assume without question that Knossos fell long before the Trojan War (ca. 1450-1425 BCE). So who is right? Homer? - us? -anyone? How on earth can we resolve the blatant discrepancy? We cannot, nor shall we ever. But the fact remains that this extremely important passage in The Catalogue of Ships in Book II of The Iliad leaves me quite unsettled. Since Homer is obviously convinced that Knossos and some 100(!) Cretan cities did figure prominently in the Trojan War, where on earth did he get his information from? I for one believe it is quite conceivable that rewrites on papyrus of some Minoan documents from Knossos and possibly even Phaistos may still have been in existence when Homer wrote the Iliad, or that at least stories of their prior existence were still in circulation. If you think correlatively as I always do, this hypothesis cannot simply be dismissed out of hand. (e) If the Minoans and Mycenaeans wrote some sort of religious and/military literature of their own on papyrus, there is absolutely no evidence that they did! This leaves us with only one final consideration. If the Minoans and Mycenaeans actually did compose documents on papyrus, where are they all? The answer to that stares us in the face. While the scribes would have taken great pains to assiduously preserve documents on papyrus in dry storage while the city of Knossos was still flourishing, these same documents would all have rotted away entirely and in no time flat, once Knossos and the Minoan civilization had collapsed. Crete was not Egypt. Egypt’s climate was bone dry; the climate of Crete was, and still is, Mediterranean. Ergo, the whole argument against the Minoans and Mycenaeans ever having had a literature of their own, composed on papyrus scrolls is de natura sua tautological, as is the argument they did. 50/50. Take your choice. But since I am never one to leave no stone unturned, I much prefer the latter scenario. NOTE: This post took me over 8 (!) hours to compile. So I would appreciate if at least some of you would tag it LIKE, comment on it, or better still, reblog it! For all the intense work Rita and I put into this great blog of ours, it often shocks me that so few people seem to take much interest in some of our most compelling posts. I am merely letting you know how I feel. Thanks so much. Reblogged this on KORYVANTES Association published work.